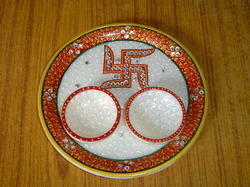 We are a leading Manufacturer of marble pooja thali from Jaipur, India. We are an unparalleled name in offering a wide gamut of Marble Pooja Thali. Made of good quality white marble, this product has been specially designed for religious application purpose. These pooja thalis are available in various colors and designs to cater diverse requirements of our customers. Our prestigious clients can avail these pooja thalis from us at affordable price in quality packing. With consistent focus on quality, our company is engaged in offering a vast range of Marble Pooja Thali. Under the guidance of our creative team of designers, the offered thali is designed and finished with the use of quality assured marble. We offer these pooja thalis in diverse colors, sizes and designs as per customer’s requirements. Besides this, our pooja thalis can be placed on your working place or dwelling place to enhance the beauty of working or living area. 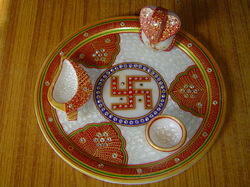 Looking for Marble Pooja Thali ?